We’d love your help. Let us know what’s wrong with this preview of Starting Over by Sue Hubbell. A pair of memoirs about a woman starting her life over as a beekeeper in the Ozarks, from “a latter-day Henry Thoreau with a sense of the absurd” (Chicago Tribune). 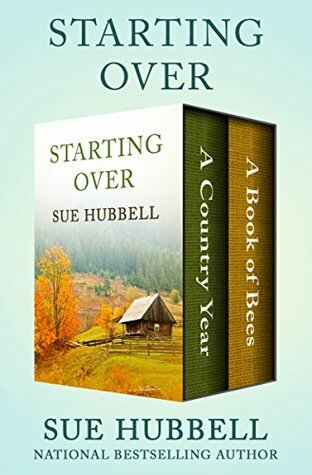 Taken together, the “steadily eloquent” national bestseller, A Country Year, and its follow-up, A Book of Bees, a New York Times Notable Book, offer a moving and fascinating chronicle of Sue Hubbell’s seasonal second life as a commercial beekeeper (The Washington Post). This book taught me a lot about beekeeping. Mostly I loved her description of nature taking over and the way it all works when we leave it alone. I enjoyed "A Country Year" more than "A Book of Bees", but that is probably because I don't know a thing about raising honeybees or taking care of their hives, which seems to entail a lot work with energy I don't have. All the detailed explanations and descriptions of the ins-and-outs of hive management was very difficult to follow along. I'm one who would need to watch a video before diving into a hobby like this, but she does tell you just about everything you need to know to understand the in I enjoyed "A Country Year" more than "A Book of Bees", but that is probably because I don't know a thing about raising honeybees or taking care of their hives, which seems to entail a lot work with energy I don't have. All the detailed explanations and descriptions of the ins-and-outs of hive management was very difficult to follow along. I'm one who would need to watch a video before diving into a hobby like this, but she does tell you just about everything you need to know to understand the interesting nature of bees as well. After watching a video for better understanding of hive management, I would definitely come back to this book for another read, which should be on every beekeepers bookshelf. In "A Country Year", the author tells little short stories of her experiences and lessons learned from nature while harvesting honey from her honeybees on her, roughly, 100 acre farm in the Ozarks in Missouri. Although 50 years old and just divorced, she hardly lets you in on the details of her starting over on her own, or even the hardships. She's a very fluid writer. Her father, a botanist, taught her to love, care, appreciate, and have great respect for all things in nature. This book is more about that appreciation and love for nature, which is why I really enjoyed it. A part of her personality is just like mine. She loves weeds, and so do I. When we come across an unfamiliar weed or insect, we both go to extremes to find out what it's all about. Is it native? Is it beneficial? For whom or what? What is its purpose? We want to know everything about it, and then...let it be.